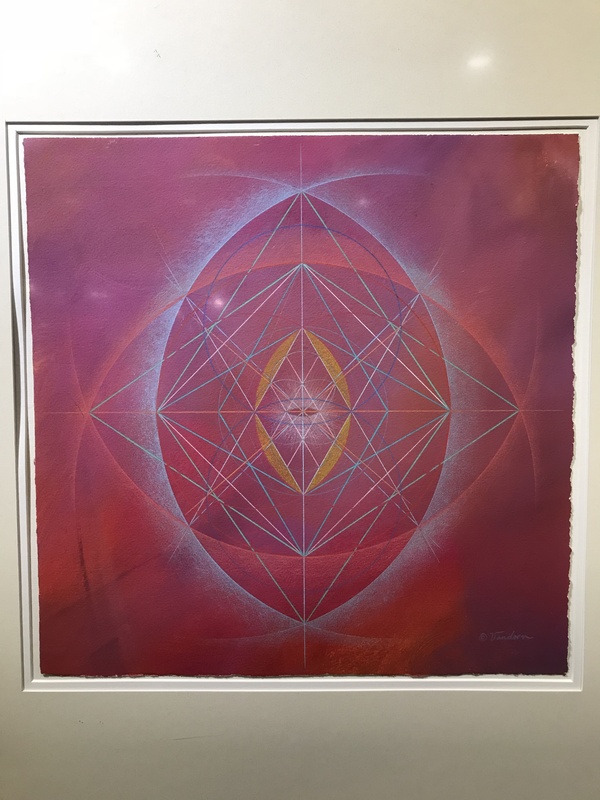 I am so happy Vandorn Hinnant sent me an invitation to his current solo exhibition “The Hidden Mathematics: a surprising connection between Math and Art” at The New York Hall of Science. This was my first visit to the Hall of Science located in a stunning 1964 World’s Fair building in Corona Queens NY. 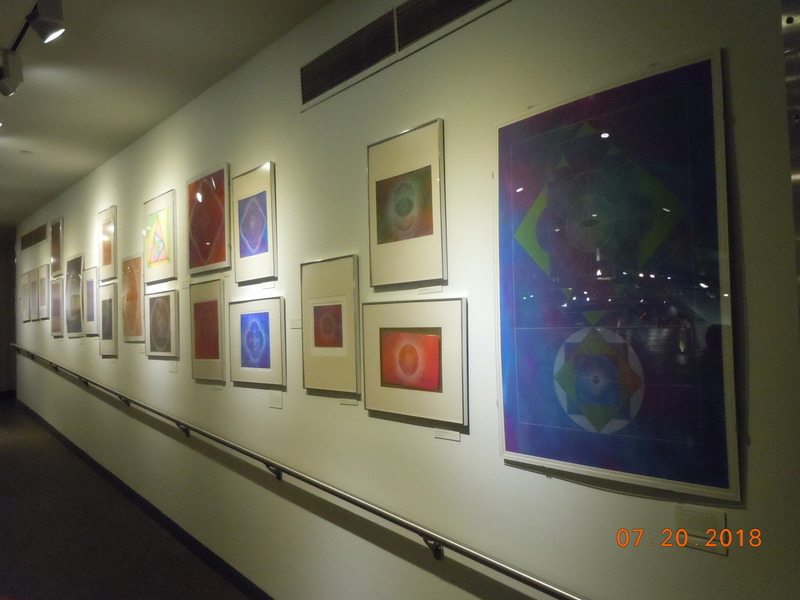 I had wanted to see the museum’s permanent “Mathematica” display for a long time but it was an amazing discovery to find out about their art galleries. What a great place to see Math Art! Hinnart’s artistic practice is a perfect example of the visualization of meta-mathematics. Interested in exploring mathematical geometric as complete systems, his drawings achieve detail and accuracy relying only on the construction rules of Euclidean geometry using a straight edge and a compass. Inspiration for these drawings and paintings come from numerous mathematical sources including the Fibonacci numbers, the Golden Mean and fractals. “Navigator’s Song” from 1995 features both horizontal and vertical lines of symmetry as well as isosceles triangle forms. 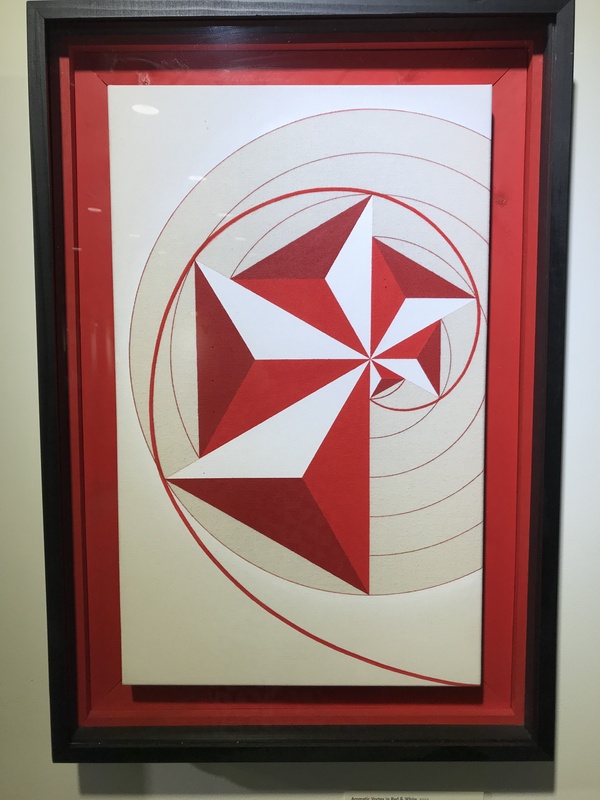 “Aromatic Vortex in Red & White” from 2012 depicts a rotating series of equilateral triangles to build a spiral, referencing the Padovan sequence. Hinnant credits the work of numerous historical figures in the development of his decades long creative process including Pythagoras and Buckminster Fuller.